Sega’s Rez is an innovative music shooter that takes the gamer into the heart of cyberspace. While this may not sound that interesting, incredible cyber visuals look simply astonishing and work in conjunction with the driving music to creating an intense feel that makes you feel like you’re inside a living mainframe. Rez is amazing in that it takes through a series of deconstructionist techno environments that evoke the feel of older games. The brilliant use of seemingly primitive wire-frames and vectors give it a distinct retro look though the graphics don’t feel dated in the slightest and makes good use of the PS2's abilities. While it may not appeal all gamers, Rez is another innovative, genre bending title from Sega that’s simply amazing. 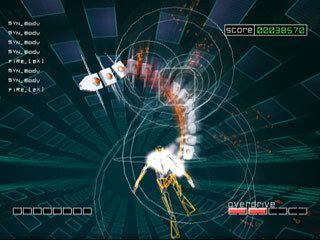 In Rez, you are a cyberspace hacker who’s trying to infiltrate a mainframe computer named the K-Project. Over the years, the soul of this mainframe has been lost, and it’s spirit, known as Eden has become confused and is rapidly spinning out of control. The mission you have is to journey into Synaesthesia and reawaken the soul of Eden and help it reclaim the spirit it once had. Rez is an incredibly brilliant, lusciously designed computer music shooter that immerses you into a cyber world. Rez’ gameplay is great but the visuals are where it’s brilliance and creativity comes to life. You’ll be amazed as the screen comes alive with brilliant color, and awesome innovative designs that effectively transport you into an alternate computer reality. This intensity is only heightened by the music, which is synchronized to the graphics, and rests perfectly in creating a hypnotic experience. This can become overwhelming, causing a bit of sensory overload at points, with dozens of objects flying at you at once. There are two main areas in each mission, infiltration where you have to destroy viruses and Boss mode, where you have to defeat a firewall. 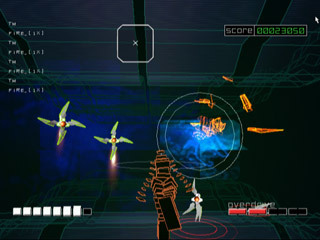 Infiltration mode is the main game, where you have to destroy viruses, the basic task here is to point your lock-on laser and shoot to obliterate them. There are many types of viruses in the game, ranging from the simple to the complex, and they’ll also shoot objects at you if you don’t shoot them fast enough. You can also collect a series of icons which can increase your characters’ level, making them more complicated in design. While the controls aren’t as free flowing as would be ideal, since you can’t really adjust your viewpoint, the interface still allows for plenty of variation within each environment. Even though Rez takes place on rails, you can still move your viewpoint around somewhat and aiming the energy laser is easy to accomplish. After you’ve beaten all the Layers, you’re then faced with a battle with the main boss of the level. 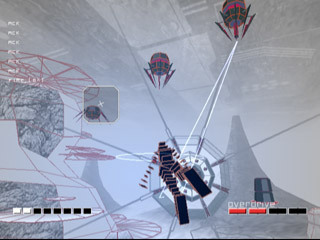 Players will have to shoot down the firewalls avoid enemy fire and decrease the bosses’ energy bars in order to win and beat that level. This isn’t as simple as it sounds, since many of the boss battles take an extended period to beat and there are multiple phases in each battle, making them endurance matches. These can become incredibly difficult enemies at the later levels, but persistence and stamina makes all the difference, keep your concentration levels high and you’ll do fine. Once you complete each level you’ll find that there are 5 levels in Rez, which are only unlocked when you complete the previous level. This seems like it means Rez is a short game, but the cool thing here is that once you beat all the levels, you can go back and play the again with new color schemes, more difficult enemies and other twists. 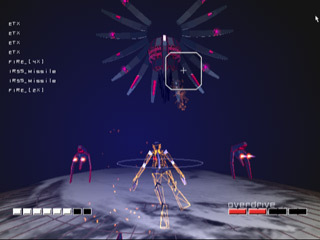 Rez also has several different modes that are unlocked when initially defeating a level including a Score Attack mode, where the object is to get a high score, a Traveling mode, where you can’t die and can just experience the game for itself. These add more replay value to the game and make its longevity more appealing. As you might have guessed, the visuals are simply amazing and despite taking an early 80’s sensibility remain quite contemporary. Rez is a cool throwback with sleek vector line wire-frames, simple polygonal objects, bright flashing colors, and general abstract geometric feel that give it a distinctive and quite beautiful style. What’s cool about this design, which even extends to the blocky fonts used throughout the menus and indicators, is that this takes place in an intense computer generated environments that evoke the best parts of the classic 1982 movie Tron. Rez takes a definite abstract look throughout and the look might be a bit shocking, especially if you’re used to today’s realistic games, but older gamers and fans of the era should definitely eat it up. The futuristic, stylish look feels authentic, yet is presented in waves of surreal colors and effects that make it feel hyper-realistic. What also heightens the sensory overload are the graphics perfect synchronization with the music. When you shoot an object, not only does the screen explode in color, you also trigger a sound sample which adds to the effect. 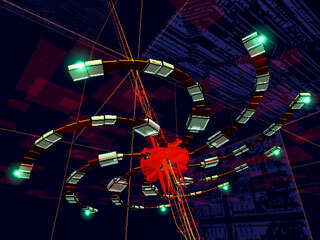 Rez is an incredibly fluid, fast moving title that creates a sensory environment resplendent in computer effects. With all the realism that’s been going on, the abstract feel of Rez makes it look and feel completely different from what’s out there. 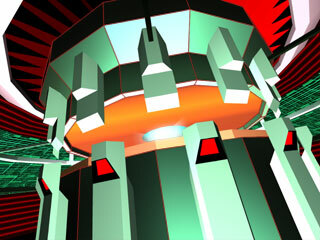 Musically, Rez implements an outstanding techno score that really helps get the player into the action. Featuring a progressive, driving soundtrack, it fits the feel of the game perfectly and we loved the way the dual shock buzzed to the rhythms of the beats on each track. The artists used include several lesser known names and also better known composers such as Ken Ishii. What’s really cool is that the tracks build in intensity as the player progresses through the layers, making this seem almost like a music composition program. Add in the fact that you trigger sound samples when you destroy an enemy and the fact that the speed and pace of the game is tied into the beats of the music and you have a title that sounds as stylish as it looks. Of course, after Sega blessed gamers everywhere with the great music Space Channel 5 and Jet Grind Radio, it should come as no surprise that this legacy continues on the PS2.